Blue Pumpkin by Barista is a quiet, ground floor event space in upcoming Seri Kembangan, traditionally known for its cottage industry. The event space is the hangout event space for lovers of coffee, bubble tea and affordable fusion cuisine. Make sure to get your hands on their exquisite dishes at the event space including Satay Chicken Rice, White Cheese Chicken Chop and Spaghetti Carbonara. An array of cakes are on display at front counter and a popular choice is the Mille Crepes and Coffee Green Tea Latte Cake. The event space will surprise many people with its inviting atmosphere of warm lighting, interesting wall plagues, cute table decorations and upbeat background music. Customers have a choice of enjoying decent coffee and signature bubble tea around clustered table seating or at deep armchairs. Blue Pumpkin by Barista offers WiFi and ample power supply outlets for customers. Staff at the event space are friendly and the event space is popular with the working crowd as it offers affordable set lunches daily. Blue Pumpkin by Barista is the ideal event space for a quiet place for reading or catching up with friends, holding a birthday party, anniversary, luncheon or any small group gathering and events as the event space can accommodate events of up to 50 pax. 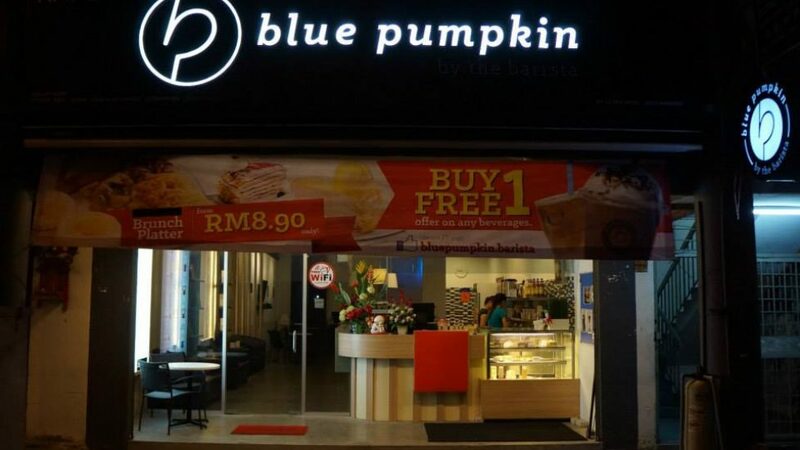 Blue Pumpkin by Barista is located at Taman Serdang Perdana in Seri Kembangan is within walking distance of well-known South City Plaza and an 11 minutes’ drive from the Palace of the Golden Horses Resort. Street parking is available around the event space.